For intersectional representations of disabled kids leading complex lives—sometimes painful, sometimes funny, never sentimentally inspirational—a vital collection. 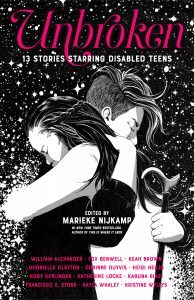 In this stunning anthology, #1 New York Times-bestselling author Marieke Nijkamp teams up with fellow disabled authors to create a collection of fictional stories that dispense with the tired, broken stereotypes–and reclaim narratives and identities. By weaving together tales of interstellar war, an enchanted carnival, or a dating debacle, Unbroken celebrates the varied experiences of disabled teens, including teens of color and of diverse genders and orientations, without obscuring the realities of their disabilities. At turns hilarious and heart-stopping, these short stories share a common thread—one that has bent over time, but will never break. Contributors: William Alexander, Fox Benwell, Keah Brown, Dhonielle Clayton, Corinne Duyvis, Heidi Heilig, Kody Keplinger, Katherine Locke, Karuna Riazi, Francisco X. Stork, Kayla Whaley, Kristine Wyllys. These tales feature teens with different mental illnesses and physical, sensory, and intellectual disabilities, but all share common threads: no overcoming disability, magical healing, or disability-as-metaphor; just kids shaped by their bodies and minds, their experiences, and the worlds they inhabit. (…) For intersectional representations of disabled kids leading complex lives—sometimes painful, sometimes funny, never sentimentally inspirational—a vital collection. The stories feature wide variety and high quality, but most importantly, none of the teens at the center of the stories are defined by their disabilities. Teens disappointed by the lack of nuanced depictions of disability in YA fiction will cheer for these compassionate, engaging, and masterfully written stories. Unbroken is a much needed short story collection featuring disabled teens as heroes of their own stories. (…) The anthology successfully subverts stereotypes and long-held literary tropes about characters with disabilities. (…) This strong assortment of stories will attract a large teen audience and should be in collections serving young adult readers. Fans of every genre will find someone to root for in this collection focused on disabled heroes and heroines. There is something for everyone in this volume. VERDICT A great choice for all YA collections. [A] gorgeous collection about disabled teenagers and their journeys through love, friendship, self-discovery, and more. The teenaged characters reflect diverse colors, genders, and orientations— without obscuring the realities of their disabilities. ☙ UNBROKEN is a Fall 2018 Junior Library Guild pick. 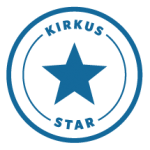 ☙ UNBROKEN is a Kirkus Best of YA 2018 pick. 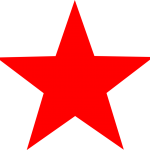 ☙ UNBROKEN is a Booklist Top 10 Diverse Fiction for Youth: 2019 pick. ☙ UNBROKEN is a We Need Diverse Books 2018 must-read. ☙ UNBROKEN is a Tor.com Best YA SFF of 2018 pick. ☙ UNBROKEN is an Ottawa Public Library Best Teen Book of 2018 pick. ☙ UNBROKEN is a The Children’s Trust Best YA of 2018 pick. ☙ UNBROKEN is a Wild Rumpus Buyer’s Guide 2018 pick.